In Nigeria, most students go to boarding school for high school (or secondary school) as we call it back at home and that experience in itself warrants a blog post on its own, but not this one. This one is all about College friendships, and I bring my high school experience up because the close bonds you build with those people you stayed in the boarding school with for about six years is definitely irreplaceable and I always thought that. I could never imagine having new friends other than the ones I knew for those six years... and then I got to college. College was very different for me primarily as an international student who knew nobody going into my first semester. The fact that I knew no one thus makes me an expert on finding your crowd, doesn't it? It was a clean slate to find and forge meaningful relationships, and now, after graduating from college, I can still agree that those friendships are some of the most important ones you'd ever have. If someone asked you today, how many friends from college do you still see or speak to? And, for my current college students, if someone asks you how many friends from college do you still see or talk to in about 4-5 years, what would your answer be? For me, I did not make a lot of college friends, but I can definitely proudly say that I still have about twenty people who are still invited to my wedding and that to me, is a success! My college friends have become and hopefully will remain lifelong friends, and that is because I found the right crowd for me as soon as I got to campus. I sought out people who had the same goals, interests, dreams and even opportunities as me and began to intermingle. I knew that College friendships were pivotal to my growth and journey into adulthood and I wanted to ensure that before the end of my college career, I had my people with me through and through. This post is a dedication to my college friends- Ruth, Lois, Rita, Moyin, Kemi, Isioma, Temi, Michael, Jide, Oni... already regret starting this list in case I miss anyone but oh well here we go...Manuel, Raven, Gabi, Dj, Cameron, Chandler, Jahel, Nick, Ruben, Brandon, Doyin, Deola, David, Silas, Cathy, Faith... and so many others! Thank you for helping this odd little girl grow out of her shell and conquer the world. 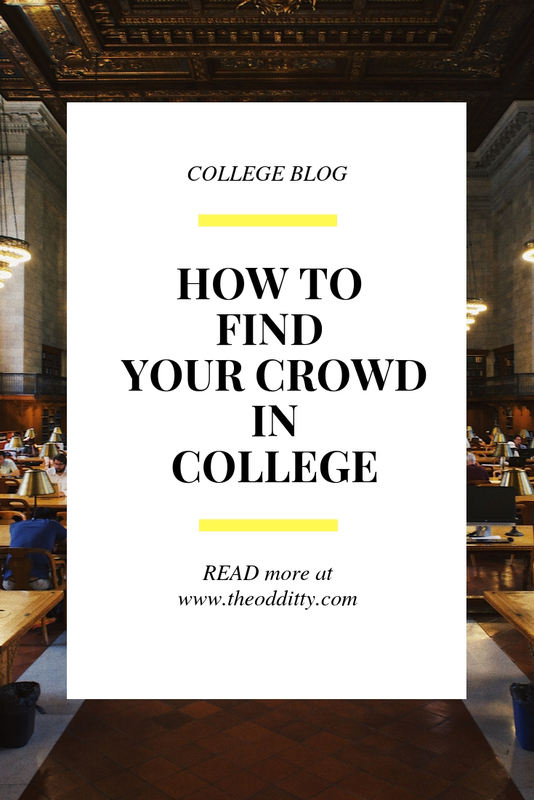 So here we go, here are a couple of ways to help YOU find your crowd in College. Okay, first things first, seek your friends out. I actively chose to go to events and specific places to find friends. Sounds weird and maybe stalkerish but I knew I wanted to hang out with Africans so I went to the African Organization's meeting. I met a lot of Nigerians and campus soon began to feel like home. That was easy because I found people from where I was from, but it can work any way that makes you comfortable. Take certain classes that will have people interested in similar things, join organizations and talk to people. Its hard to get out there but once you do it, it gets easier. Never be set in your ways that you allow that interfere with new friendships. I struggled with that, getting out of my comfort zone once I found the "Nigerian Group." I knew that if I genuinely wanted to embrace the American College experience, I would need to make friends outside my culture. I didn't look back. I learned so much from people who did not think the way I thought or even looked the way I, and that was my saving grace! Be open to meeting new people and seek out different people. The world as we know it is truly diverse, take advantage of that diversity. If you're an international student do not stick to your crowd. Seek out other types of people. My American students, seek out international students, people from different states... find people you would have never spoken to and make conversations...like I always say, College campuses are extremely diverse, take advantage of that. I wish I could write all this and more and then say that finding these friends is easy. That will be a damn lie because it definitely is not easy. But, it is worth it. Be Patient, Stay open, understand that college is a new experience for everyone not only you, and remember to stay positive. Those fantastic friendships are just around the corner.